The NCHN Quarterly Informational Call, Tips & Tricks for Smooth Board Meetings & Organizational Operations, was held Monday, September 15th. A recording of the call is available for those who missed the call. Contact Christy for the audio. Save the Date: The 2015 NCHN Leadership Summit will be January 19-20, 2015 in Clearwater Beach, Florida. More details coming in the next few days. Please join us in welcoming NCHN's newest network member, Critical Access Hospital Network (CAHN) of Newport, Washington. Many of you will recognize CAHN's Executive Director, Sue Deitz (left), who presented an overview of CAHN's HIT project at the 2014 NCHN Annual Educational Conference in St. Louis, MO. CAHN was formed in 2002 and has 13 members. Its mission is "to enhance the quality of care and test an infrastructure designed to stabilize and strengthen the local rural health care delivery system." The CAHN contributes to the success of rural healthcare in eastern Washington by delivering on three essential categories of services: rural advocacy, patient centered medical home/care coordination, and health information technology. As a result, the CAHN organizes professional peer groups, supports aggregate data sharing, participates in quality improvement initiatives, and assists with grant opportunities. Together, these services foster a learning collaborative in which the members can share best practices and leverage resources to improve performance both individually and collectively. Chairs, Chairs, Chairs – we all use them every day! Did anyone besides Mary Ann Watson, Tennessee Rural Partners, think about the chairs in your network? Mary Ann said that she was going to propose a “chair inventory” around their network! I am curious to see if anyone else conducted a “chair inventory.” Did you find any programs in need of discarding, re-branding and/or reviving, or maybe even ready to be passed off to another organization to manage? Tell us about your chair inventory. If you didn’t see Mary Ann’s response to my article last month, you can read it here. Last week, NCHN launched a new website to promote sharing of resources among health networks. 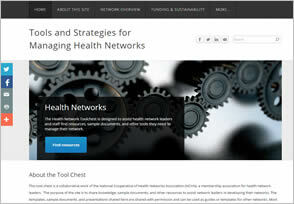 Tools & Strategies for Managing Health Networks (www.NetworkTools.nchn.org) is a collaborative web-based tool that provides templates, guides, and other information to assist network leaders in the management and development of their network. The site is organized by category and includes topics ranging from a basic overview of health networks to administrative documents, job descriptions, ROI tools, and evaluation. The site will be updated as resources are located and received. Many thanks go to the Program Development Committee (years 2011 - 2014) for countless hours of dedication to the planning of the site and to the NCHN members and other health network experts for submitting their materials to support other networks. While we are grateful to all who submitted documents, we must extend special recognition to Toniann Richard at HCC of Rural Missouri, who submitted numerous resources and has not stopped submitting templates and example for other networks. Since its initial announcement (in May) of 15 awards under the Network Development Grant Program, ORHP has announced an additional 17 awards. Among the newly announced grantees are 4 NCHN members and 1, including Arizona Rural Womens Health Network, Critical Access Hospital Network (WA), HCC of Rural Missouri, Washington Rural Health Collaborative, and Valley View Hospital (on behalf of Western Healthcare Alliance) (CO). You can search awards online here. If you have received an award notice, please let Rebecca know. GrantStation is offering a free tour of the GrantStation website at 2:00 PM ET on September 16th. Register here. NCHN Members can subscribe to GrantStation for a significantly reduced rate. Contact Christy for more information. Federal grants of $50,000 per year for up to five years are awarded through the program to support innovative, community-based child health projects that improve the health status of mothers, infants, children, and adolescents by increasing their access to health care and promoting preventive health services.